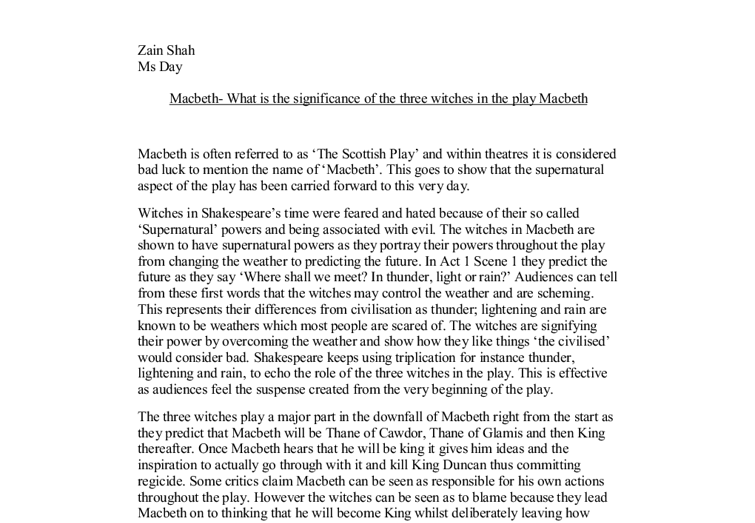 Macbeth- What is the significance of the three witches in the play Macbeth Macbeth is often referred to as 'The Scottish Play' and within theatres it is considered bad luck to mention the name of 'Macbeth'. This goes to show that the supernatural aspect of the play has been carried forward to this very day. Witches in Shakespeare's time were feared and hated because of their so called 'Supernatural' powers and being associated with evil. The witches in Macbeth are shown to have supernatural powers as they portray their powers throughout the play from changing the weather to predicting the future. In Act 1 Scene 1 they predict the future as they say 'Where shall we meet? In thunder, light or rain?' Audiences can tell from these first words that the witches may control the weather and are scheming. This represents their differences from civilisation as thunder; lightening and rain are known to be weathers which most people are scared of. The witches are signifying their power by overcoming the weather and show how they like things 'the civilised' would consider bad. Shakespeare keeps using triplication for instance thunder, lightening and rain, to echo the role of the three witches in the play. ...read more. 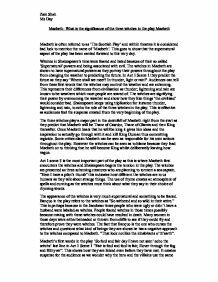 It seems to the audiences as if this role is cursed because the old Thane of Cawdor was a traitor and now that Macbeth is the new Thane of Cawdor, he will do the same thing as he is thinking about killing the king. Macbeth starts to think about the prophecies the witches had predicted and how the first one has become true. This makes him think about the other prophecies and how soon he will become a king He then believes he is destined to be king and because of that he pursues the prediction. One of the many reasons why Macbeth does not want to kill King Duncan is that he has been conscience-stricken, but continues referring to one reason "what will people think?" He cannot bear to stand the fact of what people will say as well as the accusations. Lady Macbeth taunts Macbeth as she say's 'too full of the milk of human kindnesses" she tries to put him down by saying he isn't a man. Lady Macbeth plays a major role in the play as she persuades Macbeth to carry on with the killing and this is exactly what the witches wanted Macbeth to do. ...read more. He originally feared that Macduff would kill him but after the apparitions he feels untouchable and invincible. Macbeth is tricked by the witches into thinking that he was untouchable; the blinded confidence leading to his death. But nearing the end of the play Malcolm's army held branches above themselves therefore making an illusion that the forest is actually moving towards him. Macbeth knows that the witches were telling him half-truths and now that he is in great danger. He also found out that Macduff was not woman born but ripped from his mother's womb. The predictions do come true as Macduff kills Macbeth and Macduff is not a woman born but actually ripped from his mother's womb. Ultimately the witches play a major part in the play as they predict Macbeth's success. When the first prediction came true he realised that there is a higher status and power he can achieve. They cleverly embedded greed and evil in his head. In addition this left him pondering on how to achieve is next ambition. This can be interpreted, as the witches being the downfall of Macbeth, as the witches manipulate Macbeth's action. Macbeth thought that the witches have predicted his success whereas they had prepared his downfall. ?? ?? ?? ?? Zain Shah Ms Day ...read more. Lady Macbeth's Character in Macbeth. Macbeth is no longer killing for entirely selfish reasons. He is now like a soldier, killing for survival and what he has fought for. The last time that we see Lady Macbeth in command is at the banquet in Act III. This baby could easily be linked up with Macbeth, so Lady Macbeth may slyly be saying that I would have no quarrel over killing you if it got me to my goal. In the next scene Macbeth has killed Duncan. What is the Significance of the Witches in Macbeth? We then learn how Macbeth has been given the title of Lord of Cawdor and Shakespeare uses rhyming couplets to link 'Macbeth' with the word 'death' - telling that he's winning this title but with this as a side effect he loses his honour and perhaps his life. What is the role and dramatic significance of the witches in Macbeth? "When the hurlyburlys done" 1:1:3. If you translate this you will get something like "When the boisterous activity has finished". I think that by this they mean the battle that has been going on. This is the time they will meet again, when the battle is over. Examine the role of the witches in Macbeth.